Sound Therapy is relatively new to the western world and has been linked to several ancient cultures including the Egyptians, Africans, Aborigines, Myans and Celts to name a few. Since we have lost a lot of the ancient knowledge of how Sound was used as therapy in the pa st, we are now rediscovering what sound can do for the human condition. To make it a little more bearable and to bring about change in the one seeking treatment. The subject (or client) lays on a table or in a group setting they may lay on the floor with a pillow and blanket for comfort. The practitioner uses several tools to create tones and sounds that are harmonic with the desired state of the body. Some of the tools or instruments used are Crystal Bowls, Tibetan Bowls, Native Drum & Flutes, Tuning Forks, Chimes, etc. These instruments are carefully chosen by the practitioner for their tone and frequency. How does Sound Therapy work? The use of sound as therapy can aid in facilitating a shift in our brainwaves as well as our consciousness by the use of entrainment. By providing a stable frequency, the brain will entrain to the frequency the practitioner is using, much like how a string on a musical instrument of similar resonance will ring when a harmonic string is plucked. This is called sympathetic resonance. By using stable frequencies in conjunction with rhythm, it is possible to shift our basic beta state (normal waking consciousness) to alpha (relaxed consciousness), and theta (meditative state) or even delta (sleep - where internal healing occurs). A similar result can be achieved in meditation or yoga where rhythmic breathing will bring about an altered state of consciousness. sound therapy uses frequency as the catalyst to achieve these shifts. Be aware that a healing journey, if done with courage and honesty, will shed light into every corner of the soul. When one steps onto the path of a healing journey, one has to be aware that it will touch every aspect of life, especially the ones that don't want to be touched. The treatment may seem simple, maybe even too simple. A tone is played and change is observed in the subject, it's like magic. Just know that these changes don't usually happen in one treatment. Several treatments over a period of a few months are usually what it takes in order to see a noticeable change. As the treatments continue, changes may start to be noticed in the subjects life. Sometimes the changes can bring upheaval and abrupt movement. This can be a manifestation of the clearing out that happens when things are out of balance. As the body syncs with the new frequencies, old habits and things that do not align with the new frequencies will start to fall away. This treatment is very powerful and should not be taken lightly. This is not said to scare, but to bring awareness of the true change which will come as a result. What is a Sound Therapy session like? A sound therapy treatment is both a passive and participatory experience. The passive aspect is that you become more relaxed by laying down and slowing your breath. By doing this, you prepare yourself to become the receiver of sound. It's in this place of stillness that you participate by becoming more open and aware of each sound that comes in. Sound helps create the pathway to this place of stillness the same as a mantra helps you to arrive at the still point of meditation. 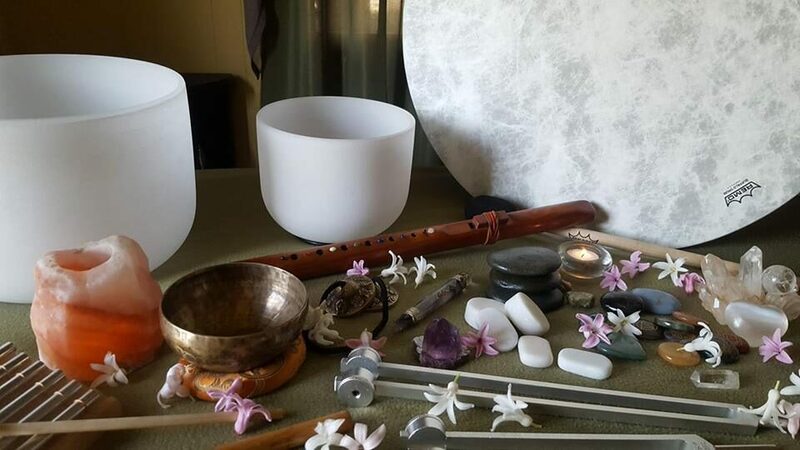 As mentioned above, several types of tools are used during a session, including voice, drumming, tuning forks and Crystal singing bowls. Awareness of intention is one of the most important parts of the process, not just on the part of the practitioner, but also on the part of the subject. Setting the intention of a session is done at the beginning of a session. It is good for the practitioner and the subject to communicate the intention before the session begins. This way the message is clear and we can bring balance into our lives. How do we define the energetic body? If we are able to shift our perspective, we can change our relationship to the issue that may be preventing us from experiencing our optimal homeostasis. Sound not only helps with inducing relaxation but also has a way of moving through areas of blockage. These energetic blockage areas can be located in our physical bodies, our subtle bodies, or both. The physical body is where we experience localized pain and discomfort. Using tuning forks, especially osteophonic tuning forks (frequency lower than 50hz), we can stimulate the release of Nitric Oxide, a free radical molecule that has been proven to positively affect pain transmission and control. Which, in short, means that these frequencies help to create a physiological reaction, while the sound itself helps to influence our auditory system, enabling us to modify our relationship to the pain. Our "subtle body" is our energetic body. This body is where our life force energy exists, commonly referred to as Qi, Chi or Prana. In Chinese medicine, meridian points are used to pinpoint areas that have restricted energetic flow to our physical and subtle bodies. The body is known to have thousands of these meridian lines that are mapped out through the body, in the same way, we've mapped out the latitude and longitude of the earth. The subtle body holds imbalances and traumas that can eventually manifest in our physical bodies, which is why it's important to look at healing and balance not only from a physical perspective but as a complete holistic experience that includes mind, body, and spirit. Sound has the ability to positively affect our whole being. Eileen McCusick, the author of Tuning The Human Biofield, has been exploring the theory that our subtle body acts as memory storage. For example, a tree has rings that extend outward as the tree grows. McCusick suggests that our subtle body expands and stores our life experiences in a similar way. If we apply frequency with tuning forks we can help blocked energy from past experiences move toward the energetic filtration system of each chakra, so that the stuck energy can be recycled back into our life force. Is our environment a factor? It's important to consider what kinds of sound we take in from our living environments. Anyone who lives in New York City knows how painful the sound of a subway train screeching to a halt feels and sounds. Loud sounds can elevate our stress levels, create imbalances in our nervous system, lower our immunity and in extreme cases, cause hearing loss. When we are stressed, our whole relationship to sound changes, and regular everyday sounds can become magnified and contribute to the feedback cycle of the stress, amplifying it even more. By utilizing sound therapy techniques, we can become better listeners and more aware of the sounds we take in. Many of us already have a pretty good understanding of the benefits of healthy eating, and the same can be true of sound. This is another example where mindfulness practices like chanting and vocal toning, can help us to find a center and feel grounded. In doing so, when we do have those stressful trigger moments, we may be better equipped to appreciate and discern the sounds more as our own unique symphony constantly happening around us, rather than feel overwhelmed by random cacophony. Our body, mind, and spirit always want to be moving in a direction toward balance, yet we often have too much outer stimulus and noise and not enough time to dedicate to ourselves, which can prevent us from achieving a better state of harmony. sound has a way of helping us get to the source of this inner peace we all desire.